You will have to indulge me with this month's catfish. You see I'm just back from a catfish collecting expedition in the Peruvian Amazon and I've decided to feature one of my catches as this months catfish. Corydoras elegans has been a mainstay within the multitudinous fish sold by Amazon based export companies for as long as Corydoras have been commercially exported. The fish is widely distributed in the wild and it is quite common to encounter different colour variations among groups of these fish that originated in different parts of South America. Furthermore the males and females look quite different. The male is smaller, less high bodied and slender. To top it off the male exhibits much more striking colouration than the drab female. Compare the image of the male above and the female below here. Below is a photograph of the very stream that we descended upon and, quite by chance, encountered a group of Corydoras. Although this and the following pictures look quite dark, they were taken at around 1 o'clock in the afternoon. 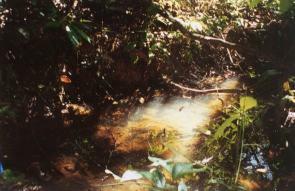 The little stream was about a mile inland from the Rio Orosa, a tributary of the Peruvian segment of the Amazon. We reached the stream by a jungle hike which was both fascinating and physically demanding. Such efforts were forgotten when, after about half an hour of catching mainly small tetras and the occasional pike cichlids, we hit upon the motherlode. Both myself and my good friend Allan James (www.scotcat.com) had stumbled upon a part of the stream that contained Corydoras. Standing waist deep in water, Allan caught the first one and soon our local guide and I were catching as many as two or three in a good sweep of the net. While we were waist deep, it should be noted that only about 12 inches of this was actually water. The rest was a bed of dead leaves and lower down a grey and orange clay. The mood went from serious concentration catching the first few to (I can unashamedly admit) gleeful laughter once it became clear that there were lots of fish to be caught. Fortune also allowed my wife, Clare, to have brought her camera with her on this particular collecting trip and so was taken the picture to the right. Yours truly and a particularly fine female C. elegans. What struck both Allan and I about these fish (and most subsequent catches) was the stunning colouration of the fish when pulled from the murky water. They were positively shining. The fish had amber fins and the colouration along the flanks of the fish was captivating. More than one opportunistic Cory escaped to freedom as we gawked at these jewels in our nets. That said, over thirty of them came home with me, the photograph of the female above is one of them. I should also mention that, now that they are established in an aquarium, these colours markedly diminished. To make up for this however and over time they have now really coloured up - the males especially are quite spectacular. 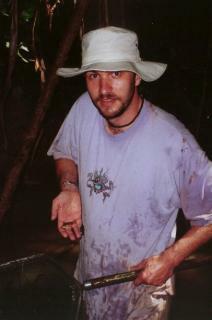 Type Locality Amazon R. at Tefé, Amazonas, Brazil. Etymology Cory = helmet, doras = skin. In this case it was incorrectly used to mean armour (cuirasse) instead of skin in allusion to the dual rows of plates that run along the flanks of this genus. From the Latin, elegans meaning tasteful, fine. A very variable species not made easier to identify by the difference in colouration of mature males and females. Similar to C. napoensis, C. nanus and C. sp. CW044 (often called C. pestai), C. undulatus and a few variations thereof. Sexing As depicted above, the male is smaller, less high bodied, slender and more strikingly patterned. Other Parameters Water composition not vital but slightly softer water within the above ranges will bring out the best colouration in the males. Furniture This fish quite likes mid-water and so provide shady open space surrounded by low plants to provide cover and a few refuges at the outskirts of the main swimming area. Compatibility As for all Corys, a perfect citizen. Suggested Tankmates Other similar Corydoras, dwarf cichlids and tetras. A robust species that will adapt to larger peaceful tankmates. Keep in a shoal of at least 6. Breeding Interesting in that this fish is not reported to follow the usual Corydoras method of reproduction. Eggs are laid by the female and placed by the female in the usual manner, but the preceding T-position clinch does not occur. Fertilisation appears to occur after the eggs are placed on plants or the aquarium glass. Fry emerge after 3 days and are free swimming in another two. The fry are quite small and should be offered small foods such as microworm or powdered pre-soaked flake food. It is also reported that males become very aggressive in the lead up to spawning and no more than three are suggested. There are 90 registered keepers, view all "my cats" data.